This is the final (hopefully!) 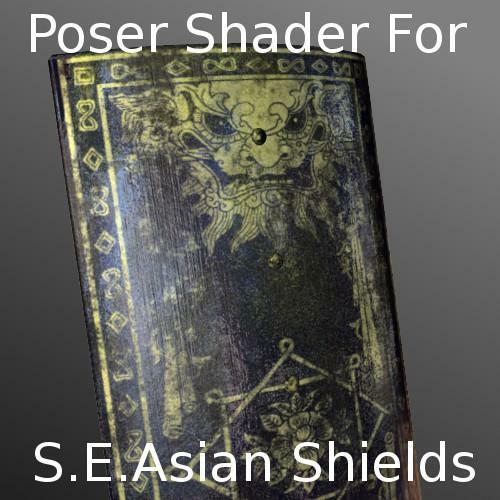 version of my Poser Triple Material Shader (TMS) for the S.E.Asian shields. Final because using it the shield looks more-or-less as I'd originally planned. There's an MC6 material collection that can be applied to any of the three S.E.Asian Shields. By default it uses the original mask for the rectangular/narrow shields, so if you want a different design, or if you apply it to the round shield, simply change the mask image (Material Room, Advanced tab, near the bottom left of the pane). There's also three MT5s for applying variants of the shader network to any material. There's also a PZ3 scene file with a simple example showing how the different parameters can be changed for different layers.